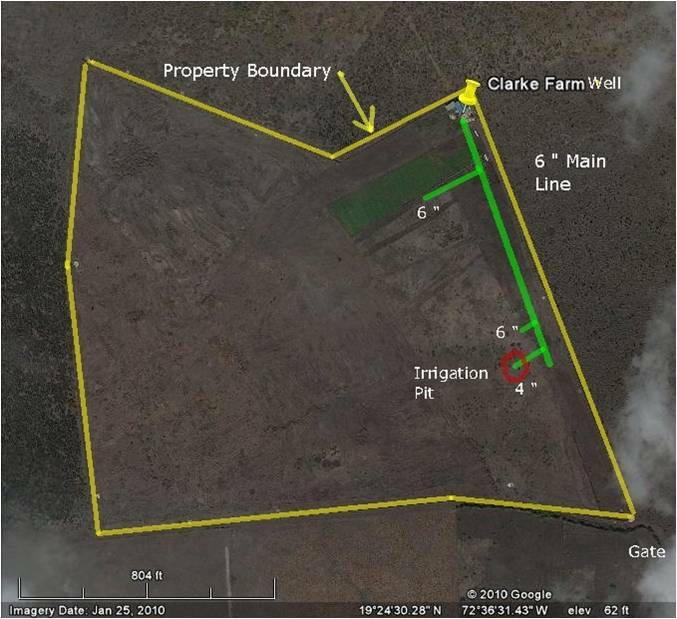 The Clarke Agricultural project is a 50 acre plot of crop land located 5 miles southeast of Gonaives, Haiti. It contains good topsoil and an excellent irrigation system that we installed in 2010. The primary purpose for the Clarke Project is to help the poor by addressing root causes of poverty and empower peasant farmers to best use their own resources, and to provide training for students who wish to pursue a vocation in agriculture. “Our vision is to help farmers become better farmers and improve their quality of life. We can do this by using all that is available to us on the land. With good irrigation, seeds, tools, and techniques, farmers can produce not only enough produce to take care of one’s family, but create a good business and make a profit. Early on, we see the value of providing a stipend to “work” the land on the project and learn by doing. What we need most right now, are some well trained people to help us manage and advance the projects,” says John Clarke, Hands Together trustee. The farm promotes experimental farming, training peasants to cultivate high-value cash crops like papaya, mango, garlic, onions, carrots and legumes. Farmers receive agricultural and small business training, work plots and then they sell their produce, keeping 80% of the profit. Young people pursuing a vocation in agriculture may enroll ina two-year program on the farm and graduate with an "Agricultural Technician" degree. We will help these graduates find work by assigning them to help the same farmers who come to the project for training. The crop land and very accessible location of the Clarke Farm make it an ideal location for an agricultural training center. The soil is very rich and there is a large aquifer that supplies our two irrigation wells. With input from ECHO (a Fort Myers based organization specializing in assisting organization help the poor through agriculture) we designed a farm model that includes tree nurseries, experimental farming areas, classrooms and quarters for Farm management. Engineers without Borders designed the irrigation system. Develop a "mini-university" on site for agricultural formation.